Flocks Heating & Air Conditioning of Cashton, Sparta, Tomah and Westby WI – Geothermal and Traditional Residential and Commercial Heating and Cooling Products and Services. Call now and talk to a live operator! THE GEOTHERMAL 30% TAX CREDIT IS BACK! Welcome to Flock's Heating & Air Conditioning, Inc.! Our mission is simple…to treat our customers the way we would like to be treated, while providing top quality heating and cooling services at the best prices possible. Whether you are designing the HVAC for your new home, upgrading from a traditional fossil fuel system to geothermal, or simply replacing a worn out furnace, boiler, air conditioner, air exchanger or other component, Flock’s Heating & Air Conditioning, Inc. can help you optimize your personal environment. We do it right! 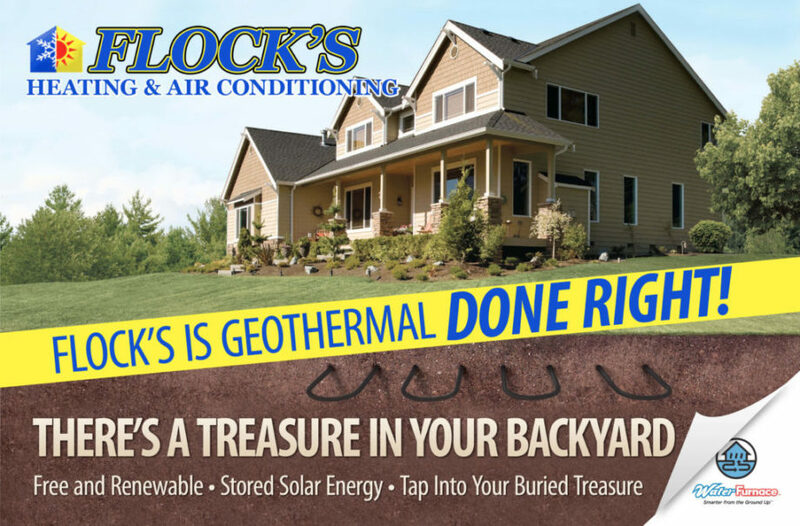 Flock’s Heating & Air Conditioning, Inc. is your local source for Geothermal heating and cooling, as well as traditional residential and commercial heating and cooling products and services. The GeoPro Master Dealer designation signifies that Flock’s Heating & Air Conditioning, Inc. is a WaterFurnace dealer who is committed to maintaining the highest levels of customer satisfaction, employee training and quality. Contact Flock's today for service, quotes, or questions! Need some help with financing your new system? Flock’s Heating & Air Conditioning, Inc. is partnering with 1st Community Credit Union to arrange for special financing. In addition, Flock’s Heating & Air Conditioning, Inc. is partnering with EnerBankUSA, to offer a variety of flexible and convenient financing plans. Ask your salesman about our 12 months same as cash, or our reduced interest 7 year loan options! An interview on WisconsinRealEstate.com, one of the top sites for Wisconsin real estate! We are featured in the August, 2014 issue of Wisconsin Energy Cooperative News.